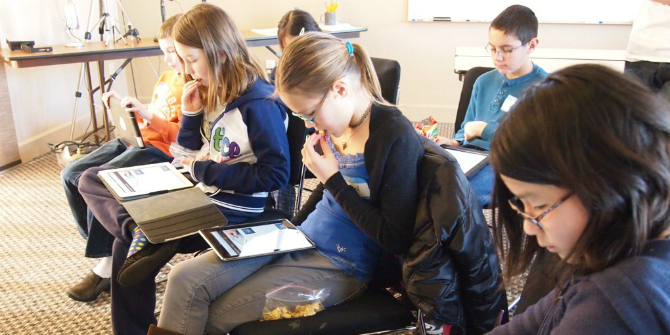 Why do educators advocate for digital media and learning, and whose interests are served? Parents turn to educators for advice on how they should integrate digital media into their children’s learning. Yet educators are not in agreement about what digital media can offer to children and young people’s learning. Summarising the key findings from an article written with Alicia Blum-Ross, published this week in a special issue of the Journal of Digital and Media Literacy, Sonia Livingstone examines how educators’ hopes for digital media have, over time, moved from ‘voice’ to ‘entrepreneurialism’ with consequences for young people and families. Sonia is Professor of Social Psychology at LSE’s Department of Media and Communications and has more than 25 years of experience in media research with a particular focus on children and young people. She is the lead investigator of the Parenting for a Digital Future research project. For our research on parenting for a digital future, we visited homes full of digital devices of one kind or another, while hearing from parents who doubt their value, who are ambivalent about screen time, or worried about traditional family values. So when we ask parents why they bought this ‘stuff’ for their children, they aren’t sure – something to do with the future, developing a new skill set, getting prepared for a changing workplace, not being left behind…. So what vision of the future does this conjure up? We have already explored some possible answers, and many more questions about technology – more digital? increasingly risky? full of educational benefits? under our control? more unequal for some? Many parents look to educators for guidance, advice and support, but what do educators in turn see as the future promise of technology, as schools and learning spaces rapidly adopt digital technologies? Indeed, as Alicia has written, there is a long history of educator initiatives using digital media to facilitate youth voice and to redesign children’s learning to open up digitally enabled pathways to collaboration and connected learning, against the values of competitive individualism and for social justice goals. Yet can these social justice imaginaries survive in a period of increasing economic instrumentalisation? This question is at the centre of a recent article that Alicia and I published in the Journal of Digital and Media Literacy, which examined how educators’ justifications for digital media and learning programmes have changed over time. They started this in order, they made a bed. No, that was just a green square, we didn’t know where this was going. Someone said that was a pillow then someone added a TV in, because then it became a bedroom because that was a bed. Someone added a bean bag so then they created this piece of art so that has been projected into a corner, they become part of the art then there is a group building up around them. It was a really fun workshop … so my intention was setting this up, showing them how it works and then they made it. There and then, it was … it happened all within 10 minutes it was fantastic. The learning experience in this account is spontaneous, creative, collaborative and expressive, just as the connected learning vision would hope. For Gus, the fact that many participants are underprivileged or marginalised is crucial in a range of ways – his efforts and those of his colleagues call on the attractiveness of digital technology to children as well as its affordances for learning, to draw in and provide benefits for precisely those who would not otherwise have access. But the more educators have to seek funding, fight for resources and worry about the sustainability of their initiatives, the harder it gets to defend these values. All the things that we do are done in such a way to make them independent learners.… We hear all the time the kids saying, why did I spend £50 on a game when I could just build my own games? The kids are very entrepreneurial, and what we do want to start running some start-up, boot camp kind of stuff, so the kids, like, if you’ve done a game and you wanted to do it, so what do you, what do you have to think about? You have to think about coding teams, you have to think about marketing, you have to think about monetisation and distribution … the kids have millions of questions about that stuff, and the kids, like, this is part of what’s exciting to them. Suzanna, an entrepreneur herself, adopts a neoliberal frame, emphasising individualism, independence, self-interest and competitive aspirations. She is frustrated by what she calls “this weird anti-commercial thing in education, which I don’t understand and I didn’t expect”, and embraces a commercial ethic as innovative and liberating, even if not always either sociable (as an experience for the children) or equalising (in its outcomes). Interestingly, for both Suzanna and Gus, the vision comes from the children, as they see it, so their task is to support and channel what’s already motivating them. For Suzanna, what motivates children is an entrepreneurial spirit, leading them to cultivate their geekiness and to look to the future. For Gus, what motivates children is the creativity that emerges through fun collaborations with and around technology, enabling the unpredictable and emergent in the present. In other words, while the notion of interest-driven (rather than school-led) learning is important, it doesn’t really help us in discriminating competitive from communitarian visions of a digital future. We cannot draw grand conclusions from these two observations, but we do note that parents’ ambivalence about the value of using digital media reflects a much wider pedagogic, public and policy debate about the values that should guide children’s upbringing. However the debate unfolds, it seems important to try to differentiate the learning processes (individual or collaborative, goal-directed or creatively emergent) that underpin competitive and communitarian visions of a digital future. And it may be even more important to ensure that the debate is explicit about the value commitments of these rival visions. At present, the discourse of competitive individualism seems more appealing than social justice alternatives, as we discussed in one of our recent posts, and the realities of getting funding means that educators of all stripes end up talking in instrumental rather than creative terms. So if we value children’s engagement with digital media learning for creative and social justice purposes, we must speak up more loudly. 1 A pseudonym for a cross-arts and digital media and learning charity in London, where we conducted fieldwork in 2015. It is funded through a mix of public funding and private philanthropy; most programmes are free or very low cost to attract young people from diverse socioeconomic backgrounds. 2 A pseudonym for a digital making and design programme, where we conducted fieldwork in 2015. It is funded through tuition payments and corporate sponsorship, and offers scholarships for participants from low-income backgrounds. *This blog post originally appeared on the Parenting For A Digital Future website and has been re-published with permission.